Charming, Rustic Cottage perfect for your next get away. This unit is set up duplex style (one side with three bedrooms two bathrooms, the other side one bedroom one bathroom. Ask how you can add the other side to your stay.) Tucked in a quiet corner on Musky Joe's Twin Pines Resort. Family-owned and ran for over 50 years! Located on a Class-A Musky Fishing Lake. Boat and motor rentals, kayak and paddle boat available, dock space, and boat landing all on-site for your convenience. Badmitton set, small swing set and sandbox, fire pit for roasting marshmallows. Picnic table and charcoal grill for your convenience. Lodge Space available for hanging out, shooting pool, (pizza and soda available for purchase in the near future.) Sprawling resort grounds and nature trails for hiking. Located on a beautiful, quiet bay teaming with wild life. You can catch pan fish, crappies, northern pike, and even musky right off one of our docks!!! Enjoy our vintage style cottages with full kitchens, bathrooms are equiped with shower stalls, and cozy living rooms. The Duplex is a three bedroom duplex style cottage. One side is set up with 3 bedrooms and 2 bathrooms, the other side is 1 bedroom and 1 bathroom. Two bedrooms are set-up with two twin beds each, and one bedrooms set-up with a double bed each. One living room has a pull-out sleeper sofa. Full kitchen and dining area for your convenience. Back deck to sit and enjoy the breeze and view. Each cottage is set up with the comforts of home, without all the distraction. Views of the famous Chippewa Flowage can be seen from each living room window. Screened in porches to have a drink while watching the sun set (or rise.) Top Notch fishing right from the docks! Each cottage comes with dock space, and a place to launch your boat right on site. Oh, and we LOVE dogs (pet fee and rules apply) ;)! Ask us about our extra rentals: Boat and motors, kayaks, and a paddle boat. We also have a few things to do on site: fire pit for roasting marshmallows, a small swing set and sandbox for the little ones, a badmitton set for the bigger littles, we're working hard on reestablishing our beach area as well. toilet, shower, Modern bathrooms with showers. Towels provided. toilet, shower, Full bathrooms with showers. Towels provided. Our resort, Musky Joe's Twin Pines Resort, is tucked away in a quiet corner of the Chippewa Flowage. Our cottages our located on sprawling grounds, with enough space between each to ensure privacy. 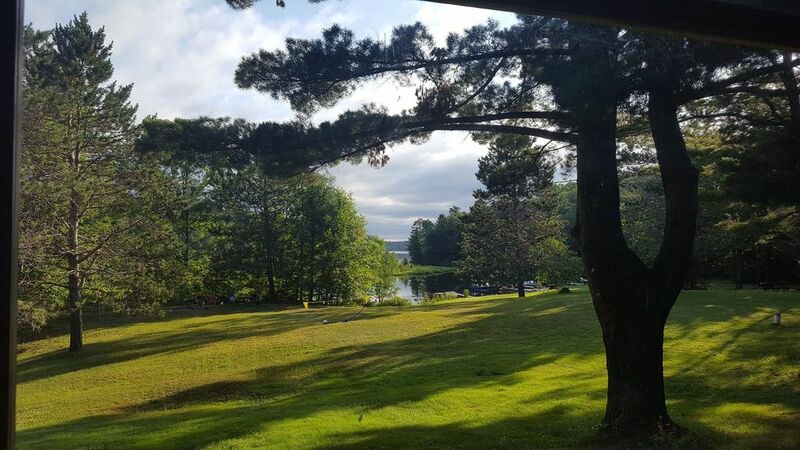 All cottages on our resort have a view of the gorgeous Chippewa Flowage. Telephone for emergency use up at the lodge. Full kitchen with dishes, cookware, oven, microwaves, and coffee pots. Dining area in the kitchens. Tables and chairs. All the comforts of home! Flat screen with DVD player. Kayak and Paddleboat available for customer use. First come first use basis. We do have old school horseshoe style life jackets available for customer use, as well as boat cushions. Had a great time with family. Rustic but clean and comfortable. Great get away for my family. We will be back. Staff is friendly and helpful. The overall property and grounds were in good shape and well-kept. The cabins were clean upon arrival and in good shape; nice and quiet place to stay. Owners/operators of the property are friendly. The only thing that I would have like to see would have been air conditioning in the cabin. Overall a good time and a good place. We are located on the Famous Chippewa Flowage in Hayward, WI. Musky Joe's Resort is located in the midst of top fishing country, access to hiking and skiing trails, festivals, fine dining, top golf courses in the country, and more.